Bellevue College basketball is happy to announce that the men’s basketball program will be offering their annual summer basketball camp. The camp is open to boys and girls grades 2 through 8. Come learn the game from the coaches and players of the NWAC qualifier men’s and women’s basketball teams. Campers will get the opportunity to learn from the same coaches and players that led the men’s team to three straight Northern Region Championships, and the women’s team to two consecutive titles. The coaches want to pass along this success to the community, using tried and true methods to help develop young players into better all around basketball players. Campers will be taught using some of the same drills and techniques that have built regional champions here at Bellevue! 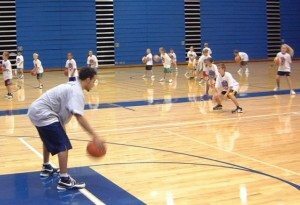 Don’t miss your chance to be a part of Bellevue College Basketball camp, enroll today!